This is a small part of the 1:200,000 topographic map of Kmel'nitskaya Oblast', Ukraine. The Smotrich river flows from the north. At Kam'yanets it enters an ox-bow, triple bend, turning sharply east, then north, then east, then south, then west, then north, then west, then south again to follow a very winding route on to the Dnister River downstream from Khotin. The old city occupies the oval with major axis north-south in the middle of this ox-bow. The modern city surrounds this area on all sides. The Dnister likewise is quite sinuous with two ox-bows between Khotin and the confluence of the Smotrich. The elevation of the Dnister at Khotin is about 110 meters. The elevation of the Smotrich at Kam'yanets is about 137 meters. 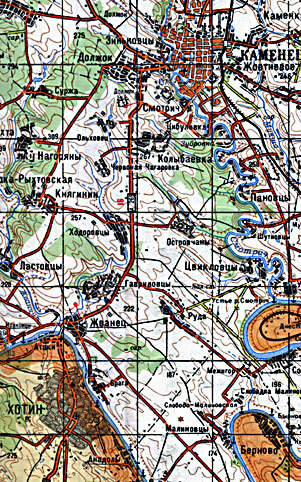 Kam'yanets castle is 1. and Khotin fortress is 2 on this map.